2017 UPDATE: I shared an updated method and recipe for making homemade candles over here. This new method uses the slow-cooker for an easy, mess-free, no-fuss experience. If you’d like to try a new-cook method, check out these beeswax taper candles. Be careful of the kombucha! One little drink, a dabble in the fermented side of the healthy bubbly soda-alternative seems innocent, until that one little sip leads to another and another. Very soon, that glass of kombucha, leads to bottles of tasty bacteria (the very best bacteria for a happy gut) in your fridge and all sorts of homemade DIY concoctions scattered across your kitchen counter. Okay, so maybe kombucha isn’t that dangerous (I really hope you know that I’m joking). 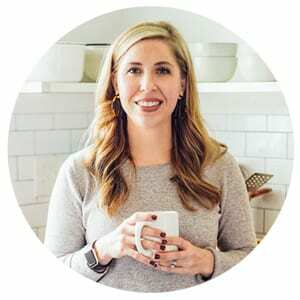 What started with a little dabbling in homemade kombucha and from-scratch food, led to a burning desire to make many of the products my family uses in our home and on our bodies. 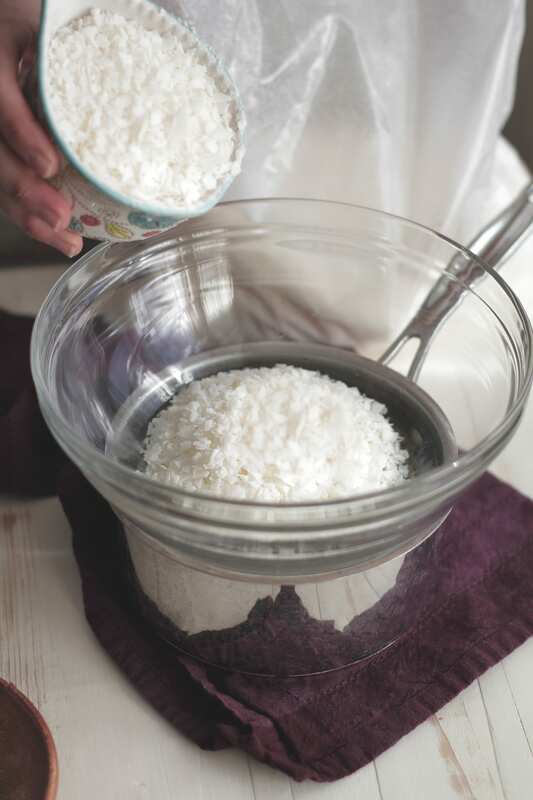 The idea for making things like hand soap, foundation powder, laundry detergent, and even my favorite bottle of lotion seemed impossible at the time and quite complicated. I started with one simple change, foundation powder, my first ever DIY. A little bit of cocoa powder, bentonite clay, arrowroot, and spices magically transformed my life. Suddenly, making-over my family’s products didn’t seem impossible or complicated. That one little DIY (and another sip of kombucha), ignited a passion for finding more products I could start making at home: hand soap, laundry soap, dryer balls (thanks to contributor Kelly), lotion, facial astringent, bathroom cleaner, Swiffer wipes, glass cleaner, and the list could go on! Now, please understand, I don’t make everything at home. I’m the first to admit that I’m in no way perfect when it comes to this whole “homemade” life. 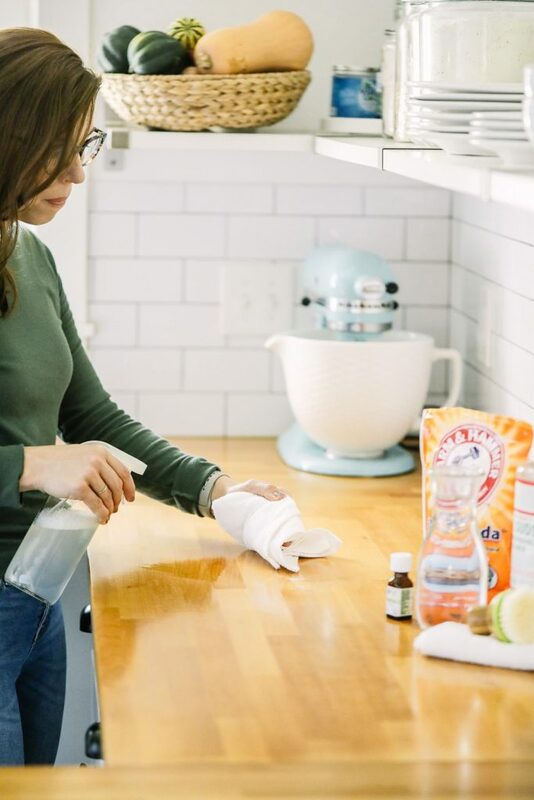 In fact, even though I love my homemade laundry soap, there are times when buying laundry soap at the store is much easier due to a busy season in life. But, with a little bit of planning and the right ingredients on hand (which I like to purchase in bulk), most of my simple DIYS take just minutes to make and last weeks, even months. Perfection is not my goal, simply a desire to simplify life and the products we use. With the holiday season upon us, my desire to DIY our Christmas, has been fully enabled. In all reality, I know DIYing our entire gift list just isn’t practical right now. Yes, we will still purchase gifts for some of the people on our ever-growing list (a wonderful “problem” to have). But, I also want to provide a little touch of homemade for our family and friends. For me, this means making simple DIYs which I know people will truly love and cherish: bath salts (a very popular request), homemade vanilla extract (another very popular request), homemade lotion, homemade cookies (a gift the kids can make), lip balm, and homemade candles. Oh yes, my dear friend, it is! I’m here to tell you (and show you) that homemade candles 100% qualify as “simple.” Actually, they are beyond simple. 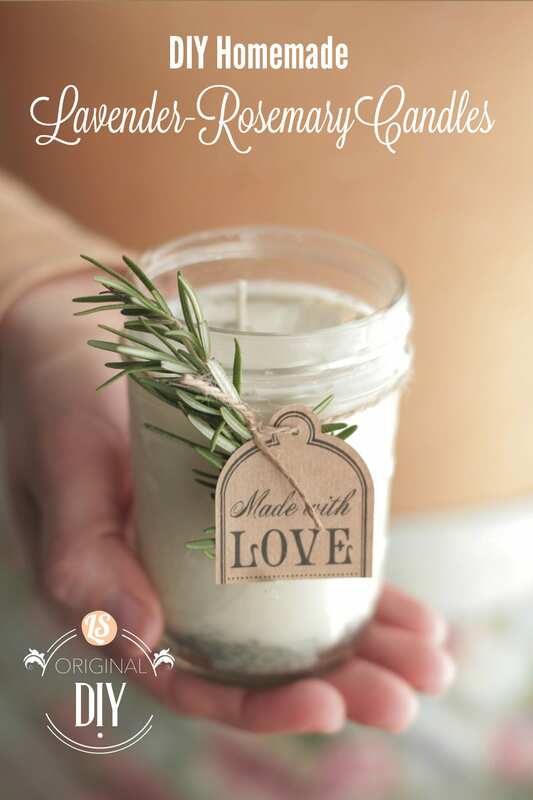 Yes, they require a little bit of time (about 30 minutes), but the end result is a gift family and friends love…a homemade candle made with love and natural ingredients. The most wonderful part about making homemade candles, is that you can use inexpensive mason jars (I purchase a pack of 12 for $8-9), drinking glasses (I like to find orange-juice-size glasses on clearance), clean baby food jars, tea cups, coffee cups, or little metal containers. There’s no limit to the scents and type of container you can use (okay, no plastic…so maybe there is a limit). 20-30 drops lavender essential oil you can also create your own custom scents with your favorite oils. In a double-boiler (or large glass bowl on top of a pot filled with 1 cup of water), bring the water to a boil. Once the water is boiling, reduce the heat and add the soy flakes. Stir the soy flakes every minute, until they are reduced to a liquid. This process can take 5 minutes. Once the soy is liquified, turn off the heat and dip the metal ends of the wicks into the wax. Place the ends in the center of each candle jar, pressing the metal ends down with a skewer or chop-stick until set. The wax acts like glue, securing the metal end at the bottom of the candle jar. Once the metal end is set in the wax, gently straighten the wick and secure it at the mouth of the jar with a clothespin (resting on the jar). Very gently, pour the wax (it helps to use a bowl or measuring cup designed for pouring liquids), into each jar. Add the essential oils to the wax (this is done to avoid burning the oils during the cooking process). I add 15 drops of each oil on each side of the jar. If desired, add the teaspoon each of dried herb. Using the skewer or chopstick, gently stir the wax, essential oils, and herbs (if using). Let the candles sit for 24 hours, until fully set. Once set, remove the clothespins and washcloths, and trim the top of the wicks to 1 inch. *4 cups of soy flakes will make 2- 8 ounce candles. This recipe can easily be doubled or tripled. Simply add the 4 cups of soy flakes to your double-boiler. As the 4 cups begins to liquify, add more soy flakes as desired. You’ll also need more jars, essential oil, wicks, towels, and dried herbs (if using). 1) is there any concern that the dried rosemary or lavender could catch on fire? 2) could you stick the container you are using straight into the water (still creating a double broiler), side stepping the need to dirty another dish and pour the liquid wax into the candle? 3) have you found the EO actually scent your room or just the candle? Here are some answers :). 1/ I was concerned about the burning this at first too. After many batches with the rosemary and lavender, I haven’t had any issues. I just add a small amount (the teaspoon recommended), so the jar isn’t overpowered by little herb pieces. If you have a spice grinder, you can grind the herbs. I’ve also done this to prevent large pieces in the candle. Either way, you’ll be safe, at least from all my experiences :). You can also try adding dry fine dried orange peels, if going for an orange-scented candle (Frontier makes a great product). 2/I’ve never tried that before. If you try, let me know! I wonder about the wicks not setting in the jar which could be difficult to work with, due to the constant heat. 3/The candle alone doesn’t have scent. The herbs add a beautiful appearance and a slight scent. I find the essential oils really do help to add a wonderful fragrance to a room and candle. When I first started making candles, I didn’t think the oils did much, until I walked out of the house (and immediately) came back in. The wonderful smell from the candle was very apparent :). Experiment with any oils you have. I think peppermint also makes a wonderful oil scent, along with vanilla and orange! I love to make all sorts of homemade things myself, including candles. I did make a candle with lavender buds in it. Once. It was fine until it wasn’t. The buds caught fire and the flames were truly scary. Just be careful and keep an eye on things. Yikes, Kimberly, that’s not good. Thank you for sharing your experience. Does the rosemary have to be dried? I have some leftover rosemary in my fridge – which is not dried – which I would love to use for this. Thanks! Hey Gail, I was concerned about fresh rosemary “going bad,” but my husband seemed to think the fresh rosemary would be preserved in the wax. I haven’t tried using fresh rosemary, but it may work? If you try it, let me know. Hi there – I actual did some internet research and everyone has the same thoughts as your husband as far as the rosemary molding if it’s fresh instead of dried! I’m going to hang the rosemary up to dry and go that route! Thanks so much – this is a great post! I love your site! Thank you for sharing, Gail! I think drying your fresh rosemary is a great idea. And thank you, I’m so glad you love Live Simply! I love love this! In fact I am getting an order together of what I need to make for Christmas gifts! Question: How many drops do you get from one bottle of the Aura Cacia essential oil you have the link to? I am making 6-8 candles and wonder how many bottles to order? Thank you….will place order as soon as I hear from you! Hey Brenda, Thank you! They make a wonderful gift!! I actually haven’t measured because I purchase my oils in larger bottles (due to the amount of DIYs I make), however, this conversion from Mountain Rose Herb (another great oil place) may help: http://mountainroseblog.com/dilutions-conversions/. Thank you so much!! This is a huge help! I’m so glad, Brenda! You can also adjust the amount of drops according to your preference, more or less. I can’t wait to hear about your homemade candles!! Hey there, I can’t wait to make this candle but I do habe a question. How many “4 cups” are in a 10 pound bag of soy flakes? Shelly, Quite a bit. I’m guessing around 3-4 “4 cups” at least (so around 12-16 cups per bag). My mom always used to keep the cardboard juice cans from concentrate for this purpose! Once the wax sets, just cut the cardboard off and you have a free-standing pillar candle! Even more frugal, and you get to show off all those lavender buds and rosemary leaves a little more. I also like to tie a bit of ribbon, raffia, or jute around the naked candle, but some burlap would be cute too. Love the recipe, want to try it soon with beeswax! That’s a great idea, Bethany! Thank you for sharing! Oh I love this idea, they look so beautiful. I had wanted to try and make candles when the candle-in-a-teacup craze was raging, though never quite got round to it. I am definitely going to give this a go before the mason jar craze finishes! Wonderful, Sabrina! I forgot about the tea cup candle craze…hmmmm…maybe I should make some for Valentine’s Day ;). Enjoy the mason jar candles!! Im need to make about 36 of these. I am assuming that I just multiply the recipe by 13 and use two double boilers. any helpful hints? Hey Tomasina, I’ve never made 36 candles with this recipe, but I’m sure it can be multiplied to make as many candles as you may need. You’ll need a very large pot/double broiler to melt enough soy for 36 candles. Let me know how it goes! My dried lavendar just flaoted to the top, will htey eventually distribute or do I need to stir it again once it starts to set? Hey Tomasina, This is pretty normal. There should be a decent amount of lavender mixed throughout the candle, but some of it will also float to the top. I find this actually helps with additional fragrance when the candles burn. Just always watch the candles when you’re burning them. Since there are herbs in the candles, I don’t advise leaving them to burn without supervision (as with any candle). I was wondering if you have tips to keeping lavender/rosemary from falling apart? When I try to keep them as a whole sprig, the leaves seem to fall off easily. Hey Deena, Do you want to add the whole herb sprigs to the soy? Hi Kristin, I made your rosemary/lavender soy candles for the first time today. I used the dried rosemary in mine but someone said that the rosemary may catch fire when the candle burns. Can you advise on this? The candle is for a gift and I don’t want them to get hurt. Hey Francine, I haven’t had any issues with dried rosemary or lavender catching on fire (fresh is a different story), but I would advise attaching a note that the candle should only burn under supervision to prevent any accidents. This is a smart precaution with any candle, particularly one that contains dried materials (herbs). I hope your recipient loves the gift :). Oooh, these look absolutely lovely! Someone mentioned in the comments above about the tea-cup candle craze! I made a whole bunch of teacup candles a couple of Christmases ago but I used a kit then and haven’t made any candles since. These look really fun to do so I might have to give them a go! The last time I made candles though I found that once they had set the kind of “dipped” in the middle where the wick was and needed topping up. Do these do that? Hey Jicsi, Thank you. Tea candles sound lovely! These will dip slightly in the center, but nothing really noticeable. Hey Charms, Thank you so much. I’m so glad you’re enjoying Live Simply! The most environmentally friendly way to make candles is with beeswax (here’s a tutorial: https://livesimply.me/2015/03/26/easy-diy-beeswax-candles/). If you can find local beeswax that’s even better! Beeswax is a natural product and even helps clean the air when used for candles. Soy is usually cheaper and the next best ingredient, in my opinion. Hey kefilwe, Are dinner candles a particular kind of candle? Kristin, thank you for this great and easy recipe. I found with the four cups of soy flakes, it only filled one mason jar, so if using masons you might want to increase the amount of flakes. Also had some trouble keeping the wick in place with the clothespins. Any other ideas of how to keep that rascally wick in place? My candles came out great, however! Hey Janet, I’m so glad you enjoyed making the candles. Yea, the wicks are tricky! My best advice is to dip the wick in the wax, then press it down in the bottom of the jar. 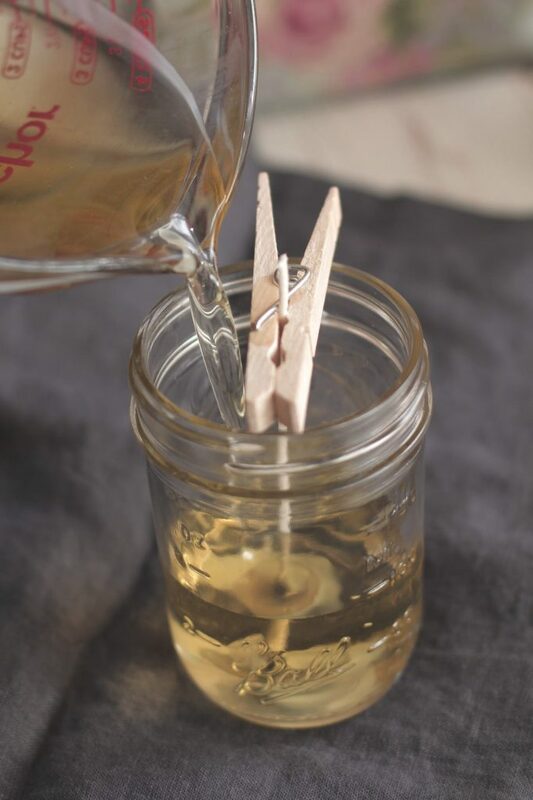 Holding the wick down and even adding an extra few drops (or even a couple of teaspoons) of wax over the wick base should help set the wick before clipping the top with the clothespin. Hi, These candles look wonderful! Tell me, do they liquefy when burning? Hey Karen, They will burn just like a candle from the store :). Just started making my own candles this fall so it was fun to come across this post while looking for ideas! In my experience tho … it is much easier and neater to add the essential oil to the wax after it’s melted BUT before it’s poured into the containers. The candles themselves seem to set up “smoother” that way and I read somewhere that somehow adding the oils to the melted wax before it’s poured and letting it cool a bit somehow makes the wax “capture” the scent better. Don’t know if that part is true but it’s definitely much neater than adding oil to the wax once it’s in the jar since I can never keep the wick straight when stirring the oil in that way 🙂 Anyway will definitely try out your idea to add lavender and rosemary leaves to my next batch! Hey Kristin! I’m looking forward to making these soon, and love the tags you have tied to them. Would you be willing to send a link for printing them? Thanks so much! Hey Kay, Here’s a link to the printable gift tags on the blog (scroll to the bottom of the post): https://livesimply.me/2015/11/21/homemade-granola-gift-ideas/. I am thinkning of making these for gifts for the Holidays but wondered how many candles come from a pound of wax? Hey Emily, A pound of beeswax should produce about 2-8 ounce candles. I was hoping to use pint mason jars for these candles, but I’m worried about the wicks. Have you had any problem with the large wicks from Candle Science (the ones you link above) not being long enough/producing too large a flame for such a small opening? This is my first time making them and I’d rather not smoke up everyone’s house for Christmas. Hey Cass, I just measured one of the wicks (I just bought more for Christmas :)) against a pint-size mason jar and the wick is just tall enough to fit the jar with a safe amount of extra wick on top. I believe there are a couple of pint-size mason jar options: wide mouth and then the traditional smaller mouth jars. I would probably go with the wide mouth jars just to be safe. The flame may leave a bit of black soot on the jars. I just made these candles. I noticed that a few of them dried with holes and cracks. Can I melt wax and just fill the cracks and holes? Do you know why this happened? Hey Kate, The cracking is generally caused by the candles cooling too fast. This is common when the candles are placed on granite or other cooler counter-tops, and the solution is usually to insulate the outside of the jars with a towel. The cracking is more of a cosmetic issue, so they will still burn beautifully! I think your idea to melt some extra wax to fill the cracks should work great! With some of the candles I made, the wicks become loose and start moving around once I pour the wax into the jars… but it doesn’t happen every time. I’m wondering if you have any insight into this? Am I not allowing the “glue wax” enough time to dry with the wick, or is it just that the wax is just so hot, it’s melted the “glue wax” again? That’s so great! I’m so glad everyone loved the homemade candles. I made a bunch of candles for our family this year, too. I’ve experienced the same issue with the wicks wiggling around after the wax has been poured. I’ve found this is caused when I don’t allow the wick to set long enough. If you allow about 10 minutes for the wicks to set in the wax and jar, the problem should be resolved. I’ll make note of this in the recipe, too. I enjoyed the recipe and the simplicity- the result was aesthetically very pleasing. The only downside was that the candles we made aren’t very fragrant. We stirred in 30 plus drops of essential oil in each vessel after adding the wax (most were 16 oz or less) of Eucalyptus, Lemon or Lavender. While not an exact measurement, I figure that “drops” are pretty universal. I used essential oils that are meant for aromatic diffusers, could that be it? I have some candle science oils coming. Any tips would be greatly appreciated. We are going to go heavier on the drops but am wondering if there are any additional pointers. They LOOK great and it was a fun project! Looking forward to round 2. Hey Nazli, Yes, the scent of these candles isn’t very strong, especially compared to a store-bought candle. There are fragrances made specifically for candles, so they produce a very strong end product. However, I’m not sure about the ingredients used to make these scents. This is probably the best option for a strong scent, particularly if you can find a more natural version. Hello! What size mason jars would you suggest? Hey Katelan, I like the 8oz. mason jars. Yes, you can use paraffin to make these candles! I have used paraffin for all candle making over the years. The hardest part is chopping the wax into melting size because the wax comes in big slabs. For melting, you can use large soup cans with a pour spout crimped into the top with pliers, and use the double boiler. Wax has a low flash fire temperature and should be melted over an electric burner, not open flame like gas or propane. I’ve never had this happen, just don’t boil wax! Each soup can can have a different scent and color as you want. I have not used herbs as fragrance, but I think this is a splendid way to avoid artificial fragrances at a lower cost than essential oils. I’ve used manufactured tin candle molds which have a small hole at the bottom to knot/tape the wick on the bottom of the mold. You can buy wax-free cotton wicks with out the metal tab by poking a hole in the bottom of milk cartons or frozen juice cans. Cover the hole and wick with masking tape to prevent the melted wax from running out. To ensure the wick is straight tie it tightly to a pencil, and rest the pencil on the top of the mold. The prep work is worth the results! When the candles are finished, I have a hard time giving them away…because they are all unique. Wax will sink down as it cools, so reserving some melted wax to ‘top-off’ the candle is a good idea. You can melt the wax from old candles over again, but the mixed fragrances are not so pleasing. Melting wax is totally Messy! Cover your counter tops and expect your stove top area to get dripped on. This blog has put me in the candle-making mode so I need to scurry out to plan some spring and summer gifts. Are soy flakes more natural? I’ve never tried them. Best of luck with your creativity and happy romantic evenings! I absolutely love the smell of cilantro and am wondering if you could make these with cilantro. Any thoughts? Thanks, Ashely! What a great idea! How well does the scent burn? I want to try this, but i also want the scent to last, burn well and really smell the aroma . Hey Inia, The essential oil won’t provide the same strong scent as a fragrance oil. I haven’t looked into fragrance oils, but there may be a safer option available? These candles look so simple! I’m so happy I found your blog. I also have a love for making things homemade for the sake of being healthy and “green”. I can’t wait to try out these candles! Thank you for sharing! Love this combination. It would be great for an outdoor mosquito candle too. That’s a great idea, Shellie! Hi There! Chelsea here from The Johnsons Plus Dog. Just wanted to pop you a quick note and let you know that this DIY was featured today on my blog for my DIY Handmade Christmas Gift Guide! I’d love for you to come take a look. Have a great day!! Hey Lib, Lol, correct. Thanks so much for catching this typo. I’ll make sure this typo is corrected. Hi! I am thinking of what to give away for Christmas and this article came of great help. Scented candles are really good and would recommend it to anyone. And I just want to share something.. it is good for our health too. Asthmatic people tend to avoid scented candles because it triggers attacks but say no more… soy wax candles doesn’t give that effect. 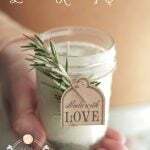 Can i use rosemary and bergamot essantial oils to make paraffin wax candles? Hey Lou, I think so. Does this throw a scent? I used patchouli essential oil eith juniper berry and no scent was thrown. Hey Lids, It will be very, very subtle, but nothing that will fill a room. I would use a diffuser for that. Hey Kathy, I don’t have much control over what Google ends up showing for search results. I understand your frustration, but that’s part of searching the internet. This recipe clearly indicates the use of dried herbs :). I hope you find some information that helps you. Made candles years ago with paraffin, before all the modern conveniences for candle making… we would attach washers to the end of a cotton string (often braided crochet thread to make heavier cord), found carefully used aluminum cans created very smooth polished candles (just carefully cut the top off as the raw edge is deadly… and now aluminum cans come in such pleasing sizes and shapes), and could use crushed ice to create an effect like swiss cheese. Also, nylon hose were great for polishing the ‘edges’ off the candles if needed. After reading your site about using EO I’m inspired to make more, again 🙂 But now you know old school methods from the 60’s and 70’s 🙂 Thanks! Great site!!! very great post.I love the post. Thanks, Anele! Enjoy making the candles. I made candles using your double-boiler method with a friend last weekend, and they turned out great! Everyone we showed them to loved them. Will definitely be making more. I loved using soy wax, it makes for pretty candles. this is fantastic. I’m using this recipe tonight! Can you tell me a good oil/wax ratio for a stand alone bees wax candle? All the recipes I am finding are for containers. Thank you for your help as am just learning about how to make candles. Hey Pat, Do you mean essential oil to wax ratio? No, I am seeing recipes calling for 1/2 cup coconut oil per 1 pound bees wax as the bees wax burns too hot by itself? Will this make the wax too soft to make a stand alone candle? Hey Pat, I don’t dilute my beeswax with coconut oil. I’ve seen recipes that do this, but I haven’t found a reason/need to do that. If you want to go this route, I’m not sure about a good oil to beeswax ratio. Hi – the link to the wax flakes doesn’t seem to be working, which brand do you recommend? Also, are the dried herbs mostly for appearance or do they add to the scent at all? Wow, this homemade candle is made by love. So love this lable, add to my gift list. I’ve been wanting to make a candle as a gift for my mom. Thank you for this tutorial!